Healthy lunchbox ideas for your kids' lunchbox (or your own lunchbox) are important. Whether it's simple or gourmet, store-bought or homemade, bringing your own lunch is the best way to keep it healthy and affordable, and it is a great way to make a small, positive change towards sustainability. Below are the basics to help you save money, eat yummier and healthier food, and create less waste at lunchtime. Unless you're bringing a sandwich that can be wrapped up in compostable brown paper or cloth sandwich bag every day, you'll need to have a couple of tightly-sealing containers to transport a wide variety of foods. Plastic containers are popular because they're light and extremely cheap, but plastic is something to avoid when possible since it will leach chemicals like BPA into the food, especially if the food is reheated in the container or as the plastic wears. Once you have some safe, durable containers a fabric tote bag will help keep your lunch in one place until you're ready to eat it. Since I'm packing a lunch for three, I use a big fabric shopping bag to carry our lunch. For single kids' lunchbox ideas you can use smaller lunch totes, drawstring bags, retro plastic lunchboxes or whatever else strikes their fancy! Of course, lunches are not all about containers and tote bags. All of that helps make your lunchbox more sustainable and less toxic, but the real magic is in the food you put in those containers and bags. Organic, unprocessed, seasonal, locally-grown and fresh lunchbox ideas are what make a mid-day meal truly healthy and sustainable. And yes, they can be just as affordable, if not more so! The cookbook, Feeding The Whole Family by Cynthia Lair features a whole section of recipes designed to go in your kids' lunchboxes, with a weekly lunch planning chart to help parents ensure lunches are nutritionally balanced. Click here for more healthy lunch ideas for kids. Remember: Bringing a litterless lunch doesn't have to mean keeping track of an elaborate set of interlocking plastic trays or expensive Bento boxes. A few durable, nontoxic containers and a fabric bag with wholesome foods inside are a simple, environmentally-friendly way to bring a healthy lunch with you wherever you go. Looking for Great, Non-Toxic Lunchboxes? 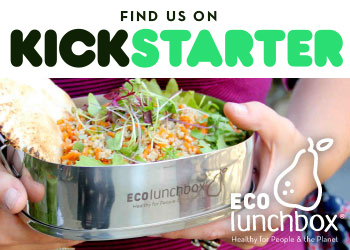 Then we highly recommend one of our affiliates, ECOlunchbox. We found and fell in love with them years ago (they were even so awesome as to hold a giveaway for our readers when we launched). Their lunchboxes are quality stainless steel, including cloth napkins and bamboo utensils. They are durable, long-lasting, non-toxic (won't leach harmful chemicals into your food), and look fantastic while eliminating waste and saving money over the long term (these things last ages!). Michelle is a freelance writer and mama to two little girls who blogs about parenting, homeschooling and playful self-discipline at The Parent Vortex.